Product #17643 | SKU BCU201 | 0.0 (no ratings yet) Thanks for your rating! The Pinpoint Precision Stylus from The Joy Factory is a stylus featuring a slim 2.4mm tip for enhanced accuracy. The tip flexes under pressure to offer the natural give of a pen against a pad of paper or the feel of your finger against the touchscreen. The tip is made of soft rubber to provide an optimal amount of friction so writing or drawing feels just like a fine pen or brushstroke. The stylus weighs just 1.2 oz, so it feels substantial while remaining comfortable for long-term use. The stylus is powered by an included AAAA battery, which lasts for up to four weeks. Meanwhile the blue indicator light lets you know when the stylus is powered on. 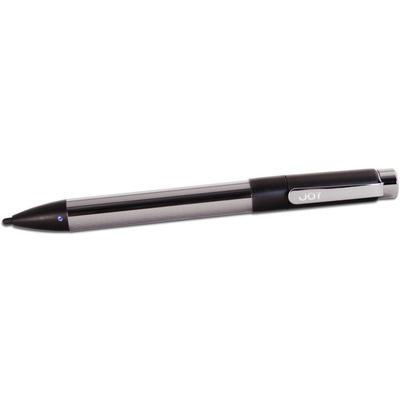 This versatile stylus is well-suited for use with a tablet to sign documents, take notes, create art, draw, edit photos, and more.